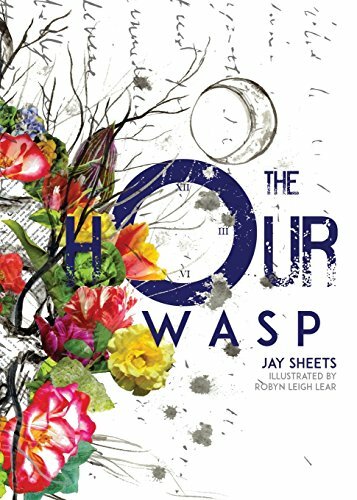 “The Hour Wasp” is a collection of forty-three different poems by Jay Sheets, accompanied by illustrations from Robyn Leigh Lear. Sheets focuses on painting rich, dark imagery with gorgeous phrasing. With lines like “horsemen who hold / our belongings in roses” (Sheets 71) and “the queen turned her head / in history…” (77), each piece is a miniature cinematic experience. The collection is broken into three sections; “[o the dark places we will go],” “[blue haunts black],” and “[the sky is white].” The first section opens the reader to a journey. The second shows the meaning of that journey, and the third lets the reader see what the poet himself has taken out of it. The reader gets to move through each section and take away their own experiences. Everyone will come away with a different truth after reading this collection. Each poem uses its first line as a title, following a gentle rhythm that suits the tone of the collection perfectly. Sheets’ style is a breath of fresh air, despite the often melancholic subjects of his poems. “The Hour Wasp” is also visually engaging. Each title is presented in brackets, and the included illustrations are splendid. The reader can’t just glance over them. They need to slow down and take in every aspect, from the dramatic shading to the more minute details that slip to the background. My favorite poem in this collection is “[in burnt-ivory morning air an ensouled plume inks].” The closing line, “… I light / a new fire at the end of myself” (75) is particularly striking. I’m relatively new to poetry. I’ve a read a few pieces here and there, but it isn’t something I reach for regularly or have a list of ready-to-go recommendations for. That being said, “The Hour Wasp” is certainly one I will offer up to friends and colleagues in the future. As debuts go, this is one of my favorites! Anyone who wants poetry to make them think should check out, “The Hour Wasp” by Jay Sheets!